You may remember my previous post about the three things that, in my opinion, stop us from using epinephrine during anaphylaxis; Fear, Inaccurate Information, and Doubt. Today, I’d like to remind you all that educating our children to overcome these obstacles is just as important. We cannot only rely on adults to know what to do. 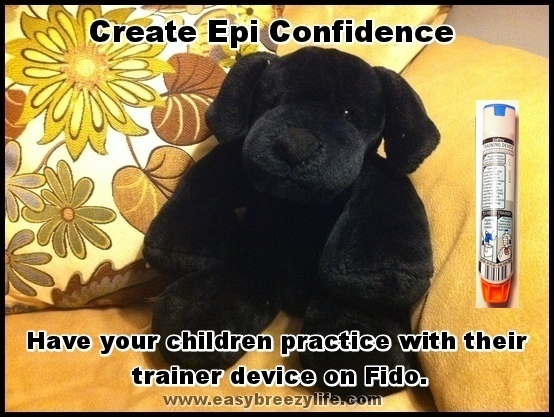 Practice EpiPen Trainer on Stuffed Animals! Role-play with the trainer device. Be the voice of the stuffed animal. Pretend the animal has specific symptoms (use symptoms & directions on the FARE emergency plan). Frequently practicing on stuffed animals breaks the cycle of fear, inaccurate info, and doubt. It gives our children the confidence, education, and power to save themselves. Try it today and continue practicing on a monthly basis. What is Anaphylaxis and Epinephrine? « Allergy Free Breakfast Muffin, or is it a Pancake?